When looking at an Oregon light pollution map, it quickly becomes clear that, while there are several pockets of serious light pollution across the state, there’s also an abundance of dark places. The lights of the main metro areas across Oregon make urban stargazing a perpetual disappointment. Portland, not surprisingly, leads the way in terms of light pollution in the state, but Salem, Bend, Eugene and Medford also have their fair share. Otherwise, darkness envelops much of the state when the sun sets each night. Organizations like the International Dark-Sky Association fight for the protection of skies with little to no light pollution, and have declared many locations across the world to be Dark Sky sites. While Oregon doesn’t play host to any of their recognized sites, there are still places across the state that allow you to see a clear, dark night sky. Venture outside Oregon’s main cities at night and you’ll find yourself surrounded by endless stars. If you want to go stargazing in Oregon, you have plenty of options. From the wild Oregon Coast to the towering Cascade Mountains and the vast high desert, Oregon is full of unspoiled, pristine nature. Far removed from artificial light, it’s these places that still offer an epic night sky. Underneath Oregon’s dark skies, you can see thousands upon thousands of twinkling stars with your naked eye, so pull out that dark sky map and get to work! Located in the Deschutes National Forest’s Three Sisters Wilderness just west of Bend, the Green Lakes make for a fantastic backpacking destination. The trailhead lies on the Cascade Lakes Scenic Byway, one of several designated scenic drives in Oregon. From there, it’s only 4.2 miles to the lakes. After a few miles through old-growth forest and along cascading creeks, you’ll emerge into an alpine wonderland. You can pitch your tent at the lakeshore for a nightly spectacle you won’t soon forget. The Green Lakes is also a great basecamp for climbs up Broken Top Mountain or South Sister, two volcanoes. 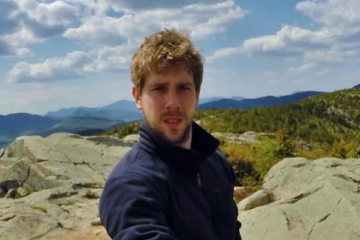 If you don’t want to carry a tent and other camping gear up to the lakes, you can also camp at Soda Creek Campground, which lies pretty much across the road from the trail. 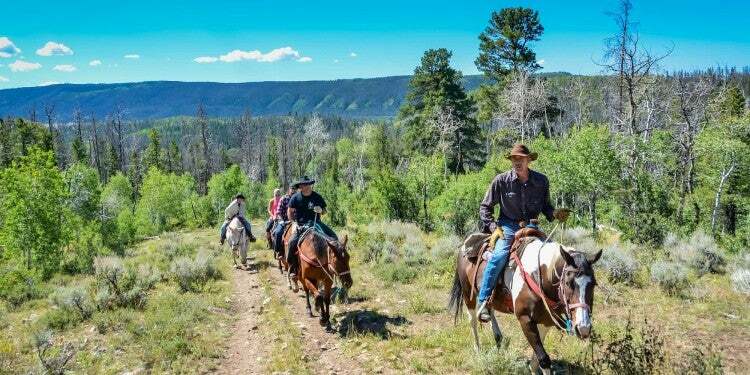 “Amazing location right on the edge of a huge meadow where Soda Creek flows through to Sparks Lake. You have views of South Sister, Broken Top, and Mt. 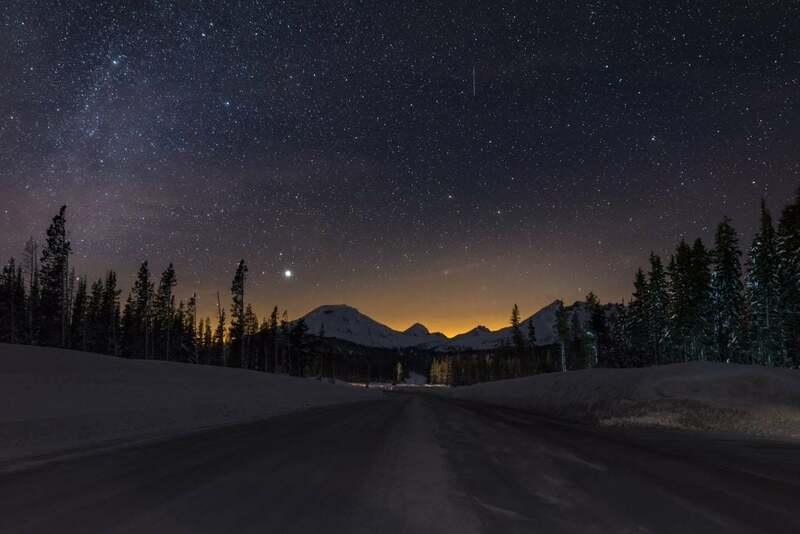 Bachelor and Sparks Lake is right around the corner… you can’t go wrong with coming here.” – The Dyrt camper James L.
Operated by the Physics Department of the University of Oregon, the Pine Mountain Observatory is one of the best places to see the night sky in Oregon. Set atop Pine Mountain in Deschutes National Forest about 35 miles southeast of Bend, its telescopes offer you the chance to peer far into the universe and see the moon and bright planets up close. The Pine Mountain Observatory is open to visitors every Friday and Saturday evening from Memorial Day weekend through mid-September. Make sure to pick a clear night to visit the observatory to make the best of your night sky viewing experience. 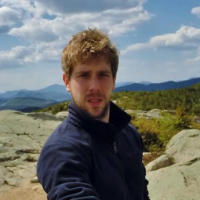 Conveniently, a first-come, first-served campground lies just across the road from the Pine Mountain Observatory. Camping at the Pine Mountain Campground is free — there is a toilet but no other facilities. Even if you’re visiting outside the observatory’s opening season, you can still enjoy the dark skies from that campground at the Pine Mountain summit. 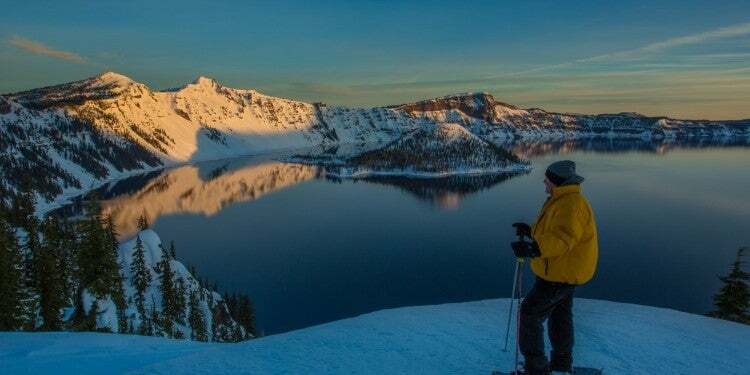 Not only spectacular in daylight when the deep, pristine water mirrors clear blue skies, Crater Lake is also a fantastic destination for stargazing in Oregon. 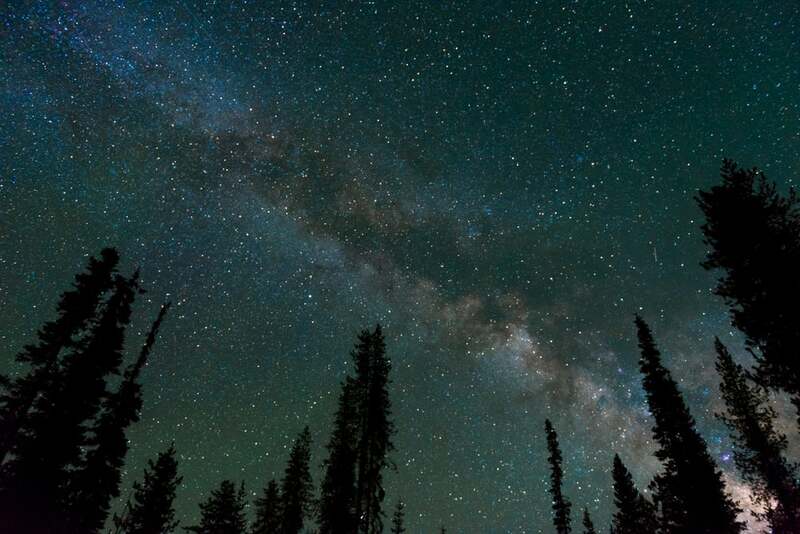 Whether hitching a hammock between two lodgepole pines at Mazama Campground in the summer months or winter tent camping along a snow-covered and car-free Rim Drive, cloudless skies in Crater Lake National Park promise an illuminated night sky. If you’ve always wanted to see the Milky Way, a look at the Oregon dark sky map reveals that there’s a solid chance of that happening at Crater Lake. “Once we set up camp we spent the evening eating and drinking warm drinks around the campfire (firewood can be purchased from the same area where you check in, and you must get firewood on site and not bring your own) , gazing at the amazing sky full of stars and the Milky Way, and as bundled up as possible!” – The Dyrt camper Dawnielle C.
A tiny historic hamlet home to just over 200 people in the Wallowa Valley in Oregon’s northeastern corner, Lostine is a great place to “get away from it all” — and that includes getting away from light pollution, cell service and Wi-Fi. And if you really want to get lost, a visit to the Minan River Lodge, only accessible via an 8.5-mile trail or charter plane, will do the trick. Also nearby lie other wild and dark places such as the Zumwalt Prairie Preserve, located in the largest and most intact surviving native bunchgrass prairie in North America. Covering 33,000 acres of rolling grasslands and home to an exceptionally high number of eagles and hawks, it’s the largest privately owned nature reserve in Oregon. Unspoiled by any city lights, the remote and underrated Zumwalt Prairie is among the best places to watch the night sky in Oregon. Though there are no campgrounds in the area, the popular Wallowa Lake State Park Campground is only an hour away and makes for a great base to explore this underrated region. The easiest-to-get-to beach from Portland, Cannon Beach is super-crowded on summer days. 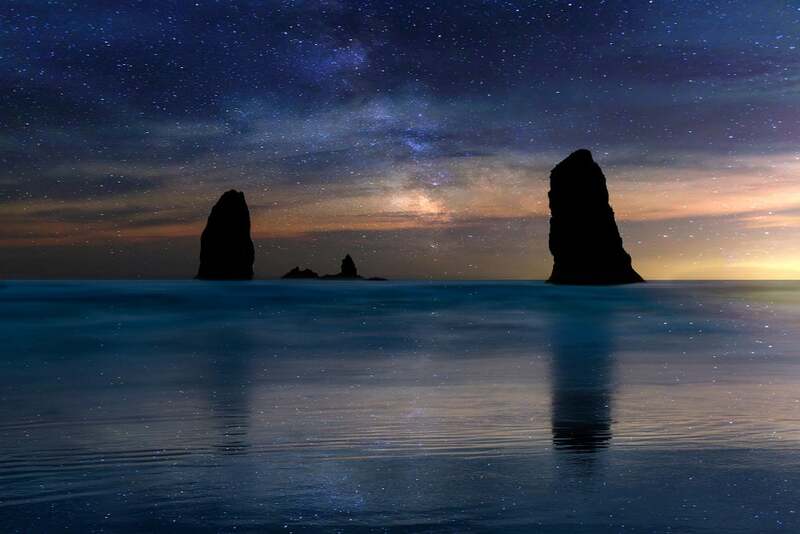 While day trippers fill the beach, admire the much-photographed sea stacks and go for hikes in nearby Ecola State Park, it’s a different story at night. When everyone’s gone back home and is sound asleep and the lights are dimmed, the stars come out. On a clear night, 235-foot Haystack Rock and the neighboring Needles stand underneath a star-studded sky to die for. Take a seat on the soft sand, listen to the crashing of the waves and look up. It’ll be hard to look down again, such is the beauty of this nightly coastal scene. 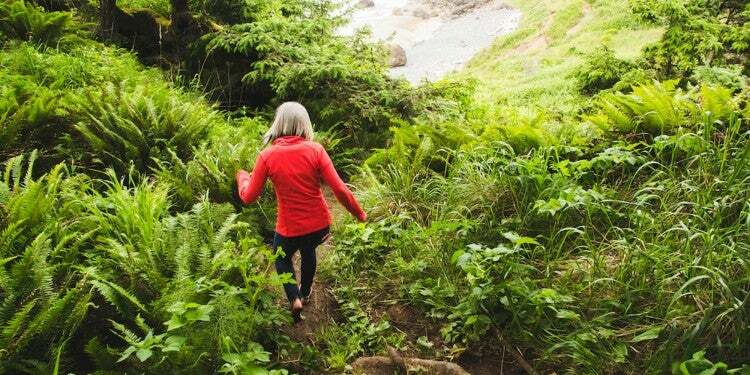 The nearest campground is Sea Ranch Resort, located only a mile from downtown Cannon Beach. Although it’s a rather pricey campground, it has plenty of sites, clean facilities and a superb location. 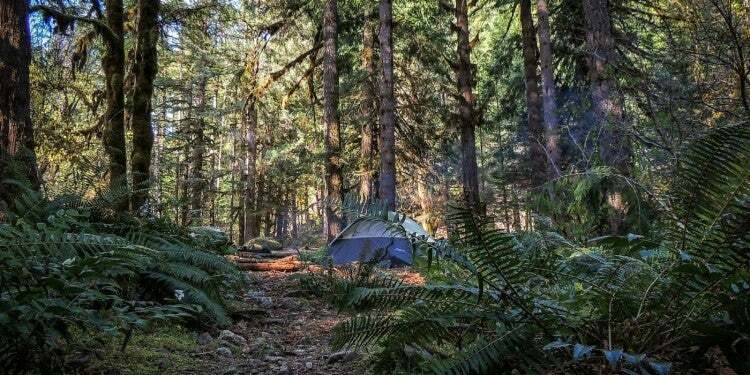 “Even though I tend to stay mostly at public campgrounds whenever possible, every once in a while a sweet private campground will pop up and make me rethink my ways. Sea Ranch Resort is one of the nice private campsites that still feels homey and unique rather than cookie cutter. Add to it that the campground is practically right in the middle of Cannon Beach, and both the location and the grounds are winners.” – The Dyrt camper Corinna B. An 84-square-mile expanse of bone-dry plains, the Alvord Desert lies in the rain shadow of the Cascade Mountains and gets merely 7 inches of rain per year. During the summer, its surface is flat and dry enough to drive a vehicle across and even land small planes on. In fact, this was the setting for the women’s world land speed record in 1976 when Kitty O’Neil reached a mind-blowing speed of 512mph. The Alvord Desert is one of Oregon’s most remote places, located underneath the Steens Mountains in the far southeastern corner of the state. The nearest town worthy of that name is Burns, more than 100 miles to the northwest. According to the dark sky map, this is one of the darkest places in Oregon. There are no official campgrounds here, but you can pitch your tent on the desert flats. After setting up camp, sit back and enjoy a glorious sunset followed by a cloud-free and star-filled night sky. Although remote, there’s no better place in the state to watch astronomical events like the Perseid Meteor Shower and lunar eclipses. 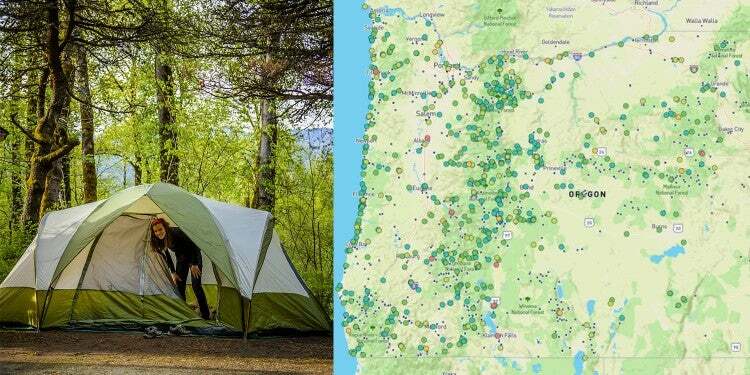 We’ve saved this list of Oregon’s best stargazing campgrounds on The Dyrt. You can view the list and save your own.